Utilizes SMAT (Super Micro Abrasive Technology) to uniformly and predictably polish. Long working time with easy wipe off. Incredibly versatile, aggressiveness can be varied with choice of pad. Can be mixed with Meguiar's compounds to adjust their cut, finish and working time. 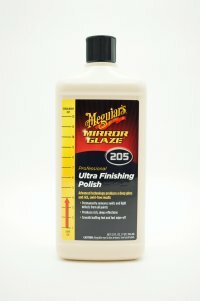 Meguiar's 205, Ultra Finishing Polish is one of the most versatile polishes on the market. It can produce deep reflections while also making quick work of medium defects. Its cutting power comes from SMAT (Super Micro Abrasive Technology) abrasives which uniformly and predictably polish down the surface. The versatile nature of 205 means different pads can drastically change how aggressive it cuts. Paired with a microfiber or wool cutting pad, 205 can make quick work of medium defects. Body shop safe and silicone free, 205 can be used to polish down freshly painted clear. With a Dual Action Polisher - Apply 3-4 quarter sized drops of 205 and evenly spread on the pad to prime it. When initially priming the pad, or using 205 to cut, load up the pad with additional polish. Set the machine to a low speed (2-3) and spread product over a 2' x 2' section using light pressure. Once 205 has been spread, increase machine speed to between 4-6 and work product making 2-4 overlapping passes using appropriate pressure for the paint type. Reducing pressure with each pass will help with soft, finicky paints. Subsequent sections only need 2 small drops of 205 on the pad once it has been primed. With a Rotary Polisher - Apply 3-4 quarter sized drops of 205 and evenly spread on the pad to prime it. Set the machine to a low speed (800-1000 rpm) and spread product over a 2' x 2' section using light pressure. Once 205 has been spread, slowly increase speed (1200-1500 rpm) work product making 2-4 overlapping passes. As 205 turns clear you have finished that section. Make sure to clean the pad and reapply two small drops to polish subsequent panels. Buff and Shine Uro-Tec Yellow Polishing Pad - The ideal choice for a well-rounded polishing pad. It has enough cut to remove defects and compounding swirls while finishing down on most paint types. Available sizes: 1 inch, 2 inch, 3 inch, 6 inch and 7 inch. Meguiar's DA Foam Polishing Disc - An alternative to the B&S Uro-Tec, this thin polishing pad works more efficiently when paired with a free spinning DA polisher with an 8 mm throw. Available sizes: 5 inch and 6 inch available individually or in a 6-pack case. Meguiar's DA Foam Cutting Disc - When paired with this pad, 205 acts as a great 1-step on harder paints. Available sizes: 5 inch and 6 inch available individually or in a 6-pack case. 205 can be mixed with Meguiar's compounds (100, 101, 105) on the pad to change the working time, aggressiveness and finishing ability of the compound. Try two dime sized drops of 205 to a matching amount of 100, 101 or 105. If you are experiencing dust, cut back your working time. Use multiple pads and keep them clean! Make sure to clean your pad after every section to remove residue buildup and maintain a consistent finish. Wipe down the surface with a panel wipe product or IPA solution before applying your last step protection. This will guarantee all the defects have been removed.